I’m not sure where to even begin with this one. 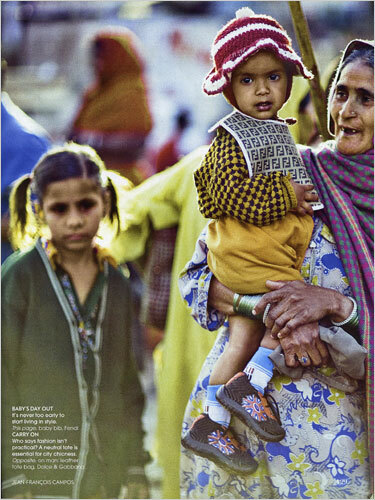 The objectification of the poor, who are used as props in a fashion magazine aimed at people very different from them? The oblivious discussion of the “power of fashion,” while ignoring the issue of how much these luxury items cost relative to average incomes in India? I’m especially struck by the way that the inability to spend $200 on an umbrella is no longer seen as a privilege because “anyone” can “carry it off”; it’s not about having $200 extra dollars, it’s about having the mindset to know you can carry these items and won’t make them look ugly or tacky, apparently. There’s a complete denial of privilege and power having anything to do with wealth, social stratification, or any inequality more consequential than some people maybe worrying that they won’t “make” fashion “look beautiful” (which in and of itself is an interesting idea–it’s not whether the fashion items make you look beautiful, it’s what you do for them). Why do I get the impression there is a lot of annoying plastic packaging lying around these shoots? I THINK THIS PRODUCTION IS NOT THAT REAL, IS MORE PLASTIC, AND THEY ARE TRYING TO MAKE THE TYPICAL AMERICAN STYLE HAPPEN, THIS IS NOT NATURAL, THEY DONT TAKE THE NATURAL AND CHIC PART OF THE COUNTRY THEY ARE DOING THE SHOOTS, AND THE FACES ARE NOT THAT NATURAL, TOO. EVERYTHING REGARDING THE PEOPLE, IS DONE WITH PRESSURE. DONT LIKE IT. comparing the cultured ('stylish', 'elegant', 'self aware') Europe with unprivileged (unstylish) Africa? Yay! Show the savages some elegance, won't you? The woman's face carries such a snotty expression it makes me want to punch her powdered nose. I had a thought about piping in to stick up for the second campaign, the Ambition series. Those pictures didn't seem as glaringly "slumming it" as some of the other ads featured on this page, and I liked how they printed the profile of the people in the shot, and you get the impression that maybe they got to keep the suit, right? I thought about second guessing the contributor's statement that Suit Supply had a predominantly white audience, especially if their suits are truly affordable. Then I clicked over to the Suit Supply website and saw that the their models came in two shades...white and whiter. Like, novelty white. As in, several of their models appear to literally have a form of albinism. My grandmother is missing teeth and carries a beautiful LV. Why assume the man holding the umbrella is poor? Why not assume that it's a gift he bought for the woman in the photo? I understand why these images offend but I find it more offensive that one would just assume people from another country are being objectified to be honest. Personally, I think the Vogue and Ambition shoots were BRILLIANT. I totally understand the $200 argument, and MAY BE Vogue used the poor as mere props, it was just another excellent, "out of the box" fashon idea for them. However, intentionally or not, they did bring joy to those people. I own a camera and I have personally witnessed the happiness and thrill it brings a person, whose picture i take when the person has never been able to afford a camera in his life. When they see their faces in that tiny screen of the digicam...I made their day. Its not like the poor are going to be put out of their misery in the near future (may be if WE try hard enough, their great grand children will lead better lives) but its these smaall pleasures in life that make their burdens easier to carry. Am sure when they see their faces in those magazines carrying stuff which i doubt I will ever be able to afford, their day will become so much brighter. I know Vogue could have donated all the money they spent on that shoot to the poor and made the poor a little less poorer and a little more happier, but this way Vogue still runs their magazine and they managed to make those people MUCH MUCH HAPPIER. Just look at the pictures, i see sheer glee in all the faces not an iota of misery. In life it is not always about the money (i know for the poor it is, and rightly so), it also is about happy experiences, and their "happy experiences" are few and far apart. I would love to wear or hold something I can't afford and click a quiet picture of it in the trial room, and its not just me, we all know the joy. So lets just be glad that the people who never have dreamt of having their pictures taken are now on the pages of one of the world's most famous magazines, holding things only a percentage of the world dreams of holding! I hope Vouge does more shoots like these, but only with the right intensions.. and it would be brilliant if Vogue paid them fairly and also let them keep the stuff. Even if they never used it, it would atleast serve as a memory. Why are people surprised by these ads. The wealth buy frivolous items and pass by the poor every day. Nothing new only now the poor participates in the offence. 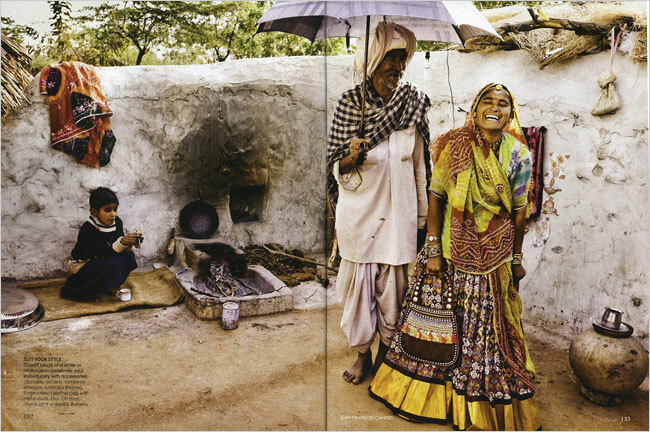 What'a amusing about the vogue india spread is that the things I guessed were the expensive fashion were not. I'd much rather wear a beautiful yellow sari than carry a grey umbrella. ridiculously unprofessional response from the vogue india EDITOR. Has she received any sort of education or global exposure to give out such an idiotic answer? Sure maybe vogue is encouraging all classes to pursue fashion as expression regardless of wealth. But in saying that she contradicts herself. She says its no longer a rich man's privelege but she is saying EXACTLY that by giving a tribal village man a Burberry umbrella to model. Are you saying that even the poor can look good if they buy $200 objects to protect themselves from the torrential rains they will probably never receive. Insensitive and embarrassing to the country Priya Tanna!